Limited Edition! Only 250 Minted! 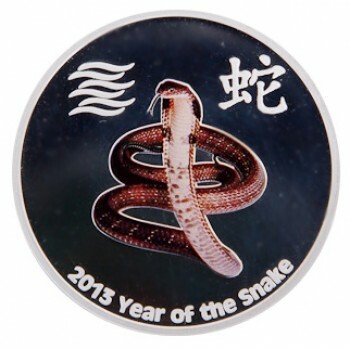 SBA's own design, 2013 'Year of the Snake" Cobra 1 Ounce Coin-like Minted 999 Fine Silver Bullion Round. Limited Coloured Edition - Only 250 Minted! Each exquisite coin-like bullion is gifted in a wood-look box, and comes with its own Certificate of Authenticity. Stamped with our registered Bullion Trading logo.